Posted 12.09.2016 at 02:09 in blog by admin / Comments Off on What are Sealants and Why Do We Need Them? Poor oral hygiene conditions are generally regarded as the major risk determinants and factors responsible for the occurrence of dental decay leading to pain, discomfort, sensitivity, mobility of teeth leading to eventual tooth loss. However, tooth decay have been observed in individuals who have regular tooth brushing habits with the help of caries resisting fluoride tooth pastes, use of dental floss thread between teeth especially after taking meals and frequently rinsing mouth with antibacterial mouth washes. Get in touch for more information on Albuquerque New Mexico Dentists Sealants. Dietary habits involving excessive intake of refined sugars, carbohydrates and sticky food products if go unchecked can cause serious harm to your teeth. Your teeth have natural structural defects and deformities especially on the chewing and biting surfaces of back teeth in the form of pits, grooves and fissures which do not allow entry of normal tooth brush bristles for achieving the required cleaning effect. These areas of teeth act as ideal spots for harboring food particles and microorganisms which can cause decaying of natural tooth enamel and dentine. Your own 24 hours emergency cosmetic & restorative dentist Dr William C Gardner at NM Family and Cosmetic Dentistry PC offers you the best solution for blocking and sealing these deep tooth surfaces with the help of dental sealants. Get in touch for more information on Albuquerque New Mexico Dentists Sealants. Food particles especially sticky potato pieces and crispy potato chips which are taken regularly by university students, young children and teenagers provide an ideal nutrition source for caries causing bacteria. These potato products are more harmful as compared to chocolates and caramels due to their high degree of stickiness to the roughened tooth surfaces, pits, grooves and fissures on the chewing areas of teeth. Chocolates and caramel products are eventually dissolved and removed by flow of saliva in your mouth. In spite of parents’ advice and dentist’s counseling, children do not refrain from taking these potato products. Before opting for dental sealants or pits and fissure sealants for blocking caries prone areas, you must have some information about these for your satisfaction and providing an informed consent to your dental health care professionals. Get in touch for more information on Albuquerque New Mexico Dentists Sealants. Q. WHAT ARE PITS & FISSURE SEALANTS? A. Dental sealants are thin consistency plastic resin materials which flow within the caries prone deep grooves, fissures, pits and crevices on the chewing and biting surfaces of your teeth in order to block the entry of bacteria and food particles. These sealants are extremely effective in decreasing the occurrence of dental decay in milk teeth as well as permanent teeth. Q. WHY DENTAL SEALANTS ARE APPLIED IN ADDITION TO REGULAR ORAL HYGIENE MEASURES? A. Deep areas of teeth cannot be effectively cleaned with the help of regular oral hygiene measures such as tooth brushing and flossing. Dental sealants aid in maintenance of oral hygiene by prevention of dental plaque and food debris accumulation in these inaccessible tooth surfaces. Q. WHO SHOULD GET DENTAL SEALANT TREATMENT? Q. APPLICATION OF DENTAL SEALS? A. Pits and fissure sealants are protective rather than corrective in nature. Ideal placing after assessment of fissure and crevice depth and angulations is important. This is before the development of tooth decay. If early caries is present in a tooth, evaluation by your dentist helps for sealing all the decay prone teeth surfaces in your mouth.Get in touch for more information on Albuquerque New Mexico Dentists Sealants. Q. HOW DO SELANT WORK? A. Dental sealants create a smooth, tooth brush bristle accessible and self-cleansable tooth surface for minimizing the risk of tooth decay. Q. WHAT ARE THE ADDED BENEFITS OF SEALANTS? A. The hardest outermost enamel layer of teeth is extremely thin in the depth of pits, fissures, grooves and crevices. 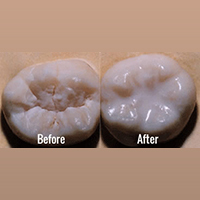 Dental sealants work to increase the thickness of this layer. Furthermore, some sealants have the inherent ability to release fluorides making the surface enamel more compact and stronger. Get in touch for more information on Albuquerque New Mexico Dentists Sealants.